One of the appetizers I chose the last time around! My favorite organic restaurant of the moment is Mind, Body, and Spirits, located on Main Street in Rochester, Michigan. Absolutely everything I've consumed there over the course of three visits has been utterly divine, including their espresso! I've never had such polenta! They serve locally grown produce whenever possible, some of which is grown on site in their greenhouse, use alternative energy to power, heat, and cool their facilities, and a great deal of their construction and renovation were done with sustainable materials such as bamboo and cork! If I recall correctly, some of their tables are made entirely of compressed flowers? Their wait staff is super-friendly and full of information. The atmosphere is hip but relaxed, non-smoking, they have tons of gorgeous artwork, and they play very cool music. They've also decorated their facilities with salvaged glass and have a rain barrel for the purpose of watering the edibles they grow! Love! I strongly suggest that if you are ever in Rochester, you put this organic restaurant on your list of must visit places. You will definitely thank me for it! I often eat at the organic/vegan/vegetarian restaurant called Seva's in downtown Ann Arbor, Michigan. Seva's offers a wide range of dishes, influenced by the cuisine of many different cultures around the world, and always has new and interesting specials to try. I have brought many meat-loving friends there who were very surprised at how much they enjoyed the experience. The atmosphere at Seva's is also quite nice. The staff are very friendly and the service is fast. Seva's also has a tradition going where customer's buy Seva's shirts and take photographs of themselves in Seva gear around the world. These photographs completely cover the walls when entering Seva's, contributing to the fun atmosphere. 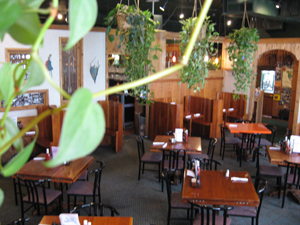 Seva's is conveniently located on Liberty Street, very close to Liberty's intersection with Main Street. 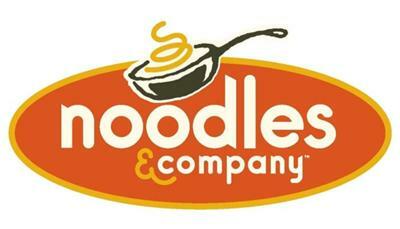 A great organic restaurant, that also happens to be my favorite restaurant as well, is Noodles & Co. 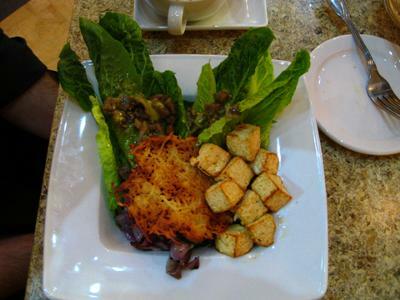 I began eating there during my short stint as a vegetarian a few years ago. All of their entrees are vegetarian and have the option of adding additional "proteins" such as chicken, beef, shrimp, or tofu. Their menu has eighteen different options in the categories of Mediterranean, Asian, and American, which include salad and soup options. They offer some organic juices and milk as well, along with organic cookies. I've eaten everything on the menu, and everything is delicious. My favorite is the Japanese Pan Noodles, which is one of their spicy options. The staff is always very polite and friendly. You order at the counter, then they give you a number and bring your meal to your table, and proudly state that they do not except tips and to leave any mess you make behind. It's a great organic restaurant to eat in with friends or family. I highly recommend it! 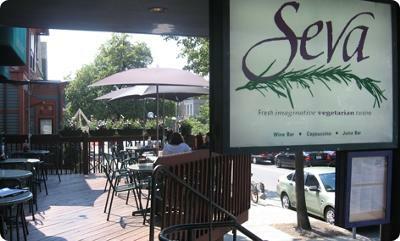 There is an awesome vegetarian organic restaurant in Ann Arbor, MI named SEVA. The food is stupendous and reasonably priced. If you have food allergies, they probably have a delicious dish you can safely eat, which you’d love to go back for! During Sangria season you can sit out on the deck and giggle all night while you watch the townies out and about. There’s a wide range of dishes, some spicy, some mild and you can tell that they use super high quality ingredients. Oh, and there’s a bar. Did I mention that? If you’ve ever wanted to try a flourless chocolate cake, this organic restaurant is the place to go. The staff is always nice and the atmosphere is cozy. There’s also a comedy club downstairs, so you can make a whole night of it. If you’re ever in Ann Arbor and don’t know where to eat, try SEVA. You’ll leave happy and feeling great about what you put in your body.